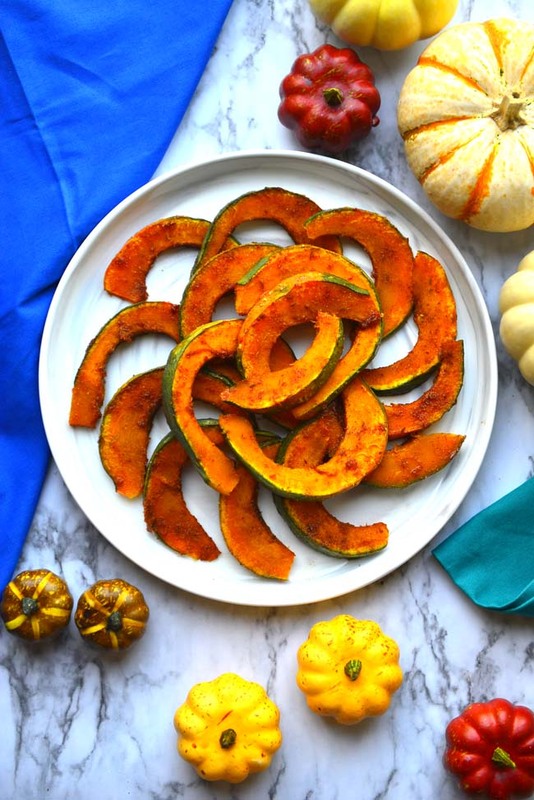 Roasted Kabocha slices make a light and delicious side dish. 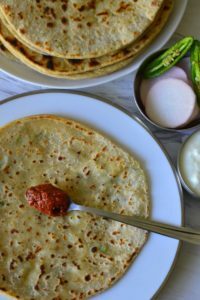 It is easy to make and can be paired with any hearty meat or vegetable entree. A perfect vegetarian/vegan side for your holiday table or anytime else ! Kabocha is also known as Japanese pumpkin. It has a thick green colored skin and light to dark orange flesh. The flesh is a little drier than the regular pumpkin or butternut squash. Here in California we see it late summer to fall – just when the fresh summer squash selections begin to dwindle. 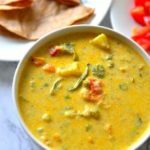 It is a popular ingredient in many Asian curries – think Thai curry – soups and fritters. The skin of this squash is edible as well. 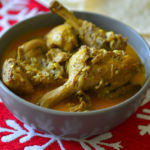 I f you are looking for spicier dry dishes to make with it look for Indian dishes like poriyals, thorans or or subzi . The beauty of this vegetable is that it cooks in no time at all. 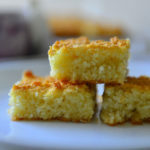 The recipe today takes only 15 minutes of baking time . Oh and did I mention that there is no need to peel the skin? The most difficult part of the recipe will be cutting the vegetable 😊 . 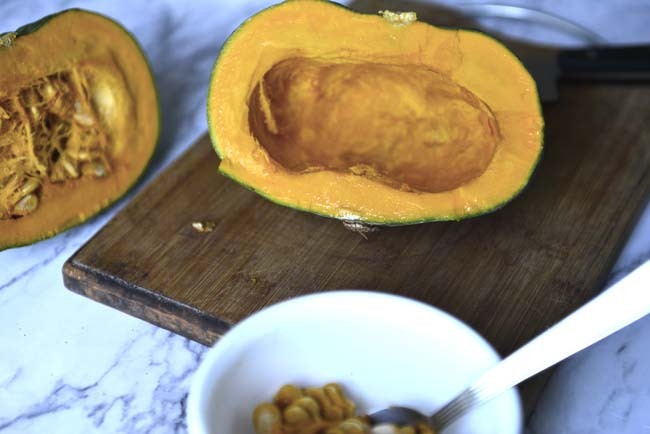 Roasting Kabocha, or any squash or pumpkin, is one of the easiest ways to cook it. Roasting concentrates the flavors and the addition of a few spices make it even more tongue tickling. After roasting the mashed pulp can be used in cookies , breads or soups. Check out this post on how to roast a pumpkin. Essentially all squashes and pumpkins can be treated this way. 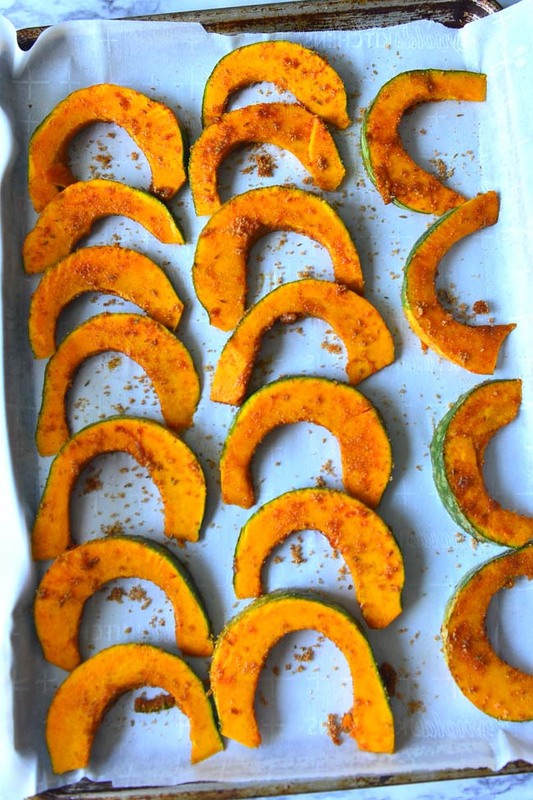 Here kabocha squash is roasted with a touch of warm spices. Kabocha squash is not as sweet as regular pumpkins , so a bit of sugar will not make it too sweet. 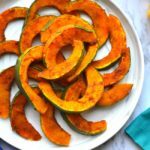 The sugar is added to aid caramelization, making the squash slices instantly appealing. Feel free to leave the sugar out if that is how you like it. Fiber , fiber, fiber – feel full longer. With the holidays around the corner and the inevitable expansion of waist line a few recipes like these become your new best friends. So I say give this a try and feel a bit better about that extra slice of pie /cheese cake or what ever you plan to binge on:- ). Spread on cookie sheet and bake ! Take the meat off the skin, mash and add to soups. This is a perfect vegetarian/vegan side dish for your holiday dinner. An easy and satisfying side dish to make. The warm spices are a perfect complement to the flavors of this hearty squash. Preheat the oven to 400°F Line a baking sheet with a silicon baking liner or parchment paper. 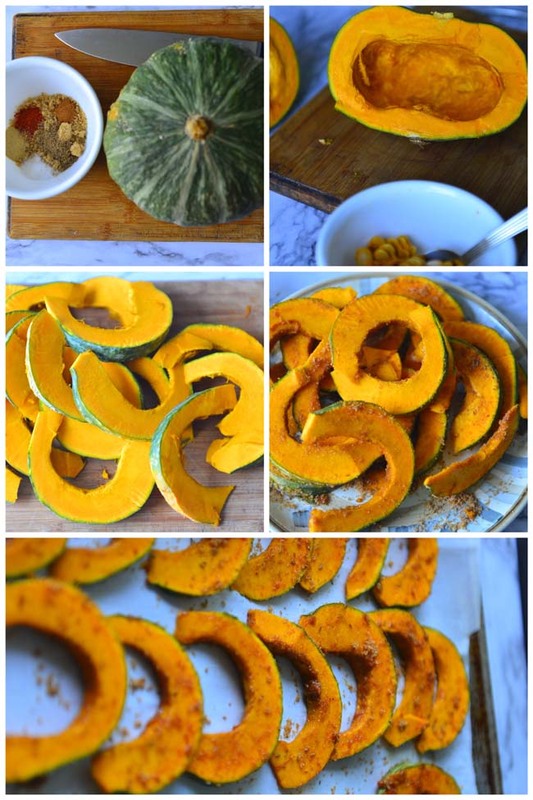 Remove the seeds and cut the squash into 1/4 inch thick slices. Combine all the dry spices. 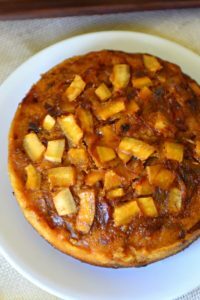 Toss the squash slices in this until coated thoroughly. Drizzle the oil over and toss again. Spread the slices in a single layer on the baking sheet. 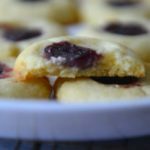 Bake in the preheated oven for 15 minutes, then turn over, and bake for an additional 5 minutes. Remove from the oven. Cool in pan for 5 minutes . transfer to serving dishes. I like t he flavors of coconut oil in this dish. Any oil with fairly high smoking point can be used in this dish. ¼ inch thick slices will be fully cooked at the end of 15 minutes. Turning them over is just to help with browning. And don’t forget to join our mailing list ! Signup below ⇓⇓⇓ if you haven’t already !!! I promise NO SPAM ! Hi, Welcome to Oventales ! I am Syama. I wear many hats here - writer, photographer and tech support to name a few. 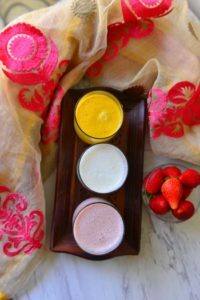 Browse around and you will find many things culinary - recipes tips and tricks and an odd science or history lesson .